For two hundred years a noble Venetian family has suffered from an inherited disease that strikes their members in middle age, stealing their sleep, eating holes in their brains, and ending their lives in a matter of months. In Papua New Guinea, a primitive tribe is nearly obliterated by a sickness whose chief symptom is uncontrollable laughter. Across Europe, millions of sheep rub their fleeces raw before collapsing. In England, cows attack their owners in the milking parlors, while in the American West, thousands of deer starve to death in fields full of grass. What these strange conditions-including fatal familial insomnia, kuru, scrapie, and mad cow disease-share is their cause: prions. Prions are ordinary proteins that sometimes go wrong, resulting in neurological illnesses that are always fatal. Even more mysterious and frightening, prions are almost impossible to destroy because they are not alive and have no DNA-and the diseases they bring are now spreading around the world. 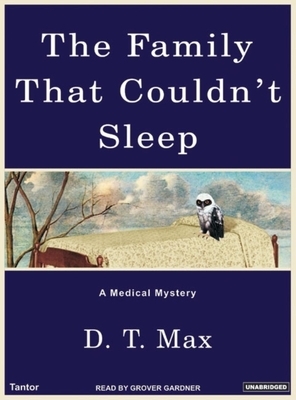 In The Family That Couldn't Sleep, essayist and journalist D. T. Max tells the spellbinding story of the prion's hidden past and deadly future. Through exclusive interviews and original archival research, Max explains this story's connection to human greed and ambition-from the Prussian chemist Justus von Liebig, who made cattle meatier by feeding them the flesh of other cows, to New Guinean natives whose custom of eating the brains of the dead nearly wiped them out. The biologists who have investigated these afflictions are just as extraordinary-for example, Daniel Carleton Gajdusek, a self-described "pedagogic pedophiliac pediatrician" who cracked kuru and won the Nobel Prize, and another Nobel winner, Stanley Prusiner, a driven, feared self-promoter who identified the key protein that revolutionized prion study. With remarkable precision, grace, and sympathy, Max-who himself suffers from an inherited neurological illness-explores maladies that have tormented humanity for centuries and gives reason to hope that someday cures will be found. And he eloquently demonstrates that in our relationship to nature and these ailments, we have been our own worst enemy. D. T. Max was born and raised in New York City and graduated from Harvard in 1984. He has been an editor at Washington Square Press, Houghton Mifflin, and "The New York Observer." Grover Gardner has narrated over 650 audiobooks, been named one of the Best Voices of the Century by "AudioFile" magazine, and has received over twenty "AudioFile" Earphones Awards, as well as two coveted Audie Awards.